Police are investigating after vandalism at a Fife primary school overnight. Heartless vandals have struck at a Fife primary school smashing equipment and destroying a garden area. 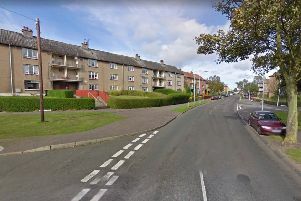 Pupils and staff arrived at Pitcoudie Primary School in Glenrothes to find a scene of devastation with planters and other items from a communal garden either destroyed or scattered across a wide area. Pupils point to the damage of the shelter's roof. A bench, which had been specially made by pupils from the school, was also smashed beyond repair, while a the roof of a playground shelter was also damaged. The damage is thought to have been caused yesterday evening (November 1) and the school is now appealing to anyone who may have seen people acting suspiciously to come forward or inform the police. There has been wide spread anger throughout the local community after the school shared pictures of the mindless destruction on social media. Head teacher Carole Storrs was the first to discover the damage when she arrived at the school this morning (Wednesday), and was shocked by what she found. Planters, rasised beds and other items were destroyed. There were raised beds turned over and smashed, plants ripped up, plant pots destroyed and other items either missing or broken beyond repair,” she explained. As the clean up began, pupils found two specially made benches in nearby woodland which had also been broken apart with an unsuccessful attempt to set them alight. “We are an environmentally friendly school, having recently achieved two significant awards,” explained the head teacher. Two benches, made by the school children were smashed beyond repair and dumped in nearby woodland. “We were hoping to extend the school grounds but in light of this, we will have reassess if that is now worth while,” she added. A Police Scotland spokesperson said: “Police in Glenrothes received a report of vandalism at a Pitcoudie Primary School which happened overnight between Tuesday November 1 and Wednesday November 2. “Inquiries will be made into the full circumstances.